Stealth Finish rings are some of the most unique, eye-popping rings you can find. This is because while most rings are gold or silver, the Stealth Finish ring is all black. Stealth finish rings are perfect for someone who wants their ring to make a bold statement, who wants their ring to attract attention, or who simply wants to stand out from the rest of the crown. Spirit rings are those that not only show that you graduated, but that resemble school pride. They often have a gold or silver outline, with the school colors as the background. Spirit rings can be purchased in a variety of different colours, and are some of the prettiest types of class rings out there. These types of rings are popular among sports players who want to show off their team colours. Want a ring with character? A prism ring is one of a kind, with an iridescent finish that showcases an entire rainbow of colours. These rings aren’t for everyone, but are for those with colorful personalities, or those who want to stand out in the crowd. Many prism rings also feature gems in the center. These gems can relate to school colors, birthday stones, or just personal preference. You don’t have to go all out when it comes to a school ring. Some of the most beautiful class rings are the ones that are kept simple. These rings are good at blending in, and can be worn anywhere without attracting attention. So when you’re 80 year’s old still wearing you class ring, you won’t look silly, you’ll just look classy! Though not always the case, many people like to use stones in their high school class rings. There are dozens of different stones that you can choose to use as the centerpiece of your ring – Amethyst, Sapphire, Emerald, Pearl, Turquoise, and so on and so forth. These make for an excellent statement piece, and a beautiful addition to any ring. Don’t want to use a traditional stone in your ring? Why not go for a patterned one? Depending on where you purchase your ring, many sellers offer patterned options. Whether you like plaid, leopard print, or camouflage – the skies the limit! Not everyone can afford a gold or silver ring. For those who just want to keep things simple, or who don’t want to spend a lot on a class ring, a metal ring can be a perfect option. 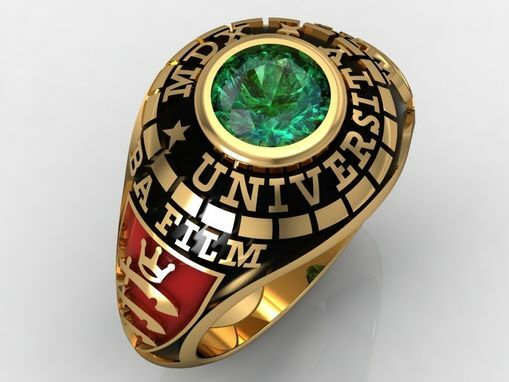 The truth is, there’s hundreds of things that you could do with your class ring. Each ring is customizable based on your personal preferences. But to help you decide, why don’t we take a look at the benefits of the two most common ring types. Since the beginning of time, gold has been a symbol of wealth and status. Gold is often used in skincare. It will not leave rings or marks on your fingers. The truth is, silver and gold are both excellent ring options, and they are the most popular for a reason. With that being said, if you don’t want to follow the trends of the crowds, additional options like Stealth and Prism are also available. Choose whatever ring suits your personality best and it will be something you can carry along with you forever!